Again last month we saw imports of gold into Switzerland and then exports to Asia and India. Last month, over 70% of the gold import figures (into Switzerland) came from London and the United States. We again see that Switzerland is buying the 400 ounce bars from the UK and US bullion banks and converting them into 1 kilo bars and then shipping them on to Asia. Last month there was hardly any buying from the mines. It all came out of London and New York. And that proves again, Eric, that central banks are either leasing their physical gold into the market or selling it covertly. We are delighted to send you the 12th edition of our annual “In Gold we Trust” report titled “Gold and the Turning of the Monetary Tides”. 3) Change of the tide in technology: Crypto currencies and the blockchain-technology have come to stay. Gold and cryptocurrencies are not foes, but friends. In fact, a collaborative approach would play to the strengths of both. The first gold-based cryptocurrencies are underway as we speak. It's All Saints' Day and silver spot has just increased. Why? Whoa Nellie! I see they just applied the brakes. Cool. and another 21 sets of those 30 x one gram Hong Kong rounds from ebay. The wish list above, if and when completed will complete my active silver stacking phase. Affording all of that wish list will take about a half year of prioritized spending at today's low prices. I will be pleased and a bit surprised if I can still afford silver by then, for whatever reason. Is this the wish list of a stacker or of a collector? I hope that'll the market manipulators will wait until Spring before allowing the price to correct. There was no real mystery, you just forgot to put one other chart on the screen and that was of the US Dollar index showing an inverse of what Gold and Silver was doing for the same time frame. Sometimes they move together, sometimes they do not and sometimes they are in sink showing an inverse reaction on the charts. This just happened to be one of those day's. Interestingly, I made a comment about this only yesterday on YouTube. Actually in many cases there is little difference between a stacker and a collector. I include myself in both camps, and I'm sure that I'm not unique. I do wonder why the spell checker in Firefox highlights stacker. However because I tend to post eye opening truth, I'm often shadow banned and my comment may not be visible for you. 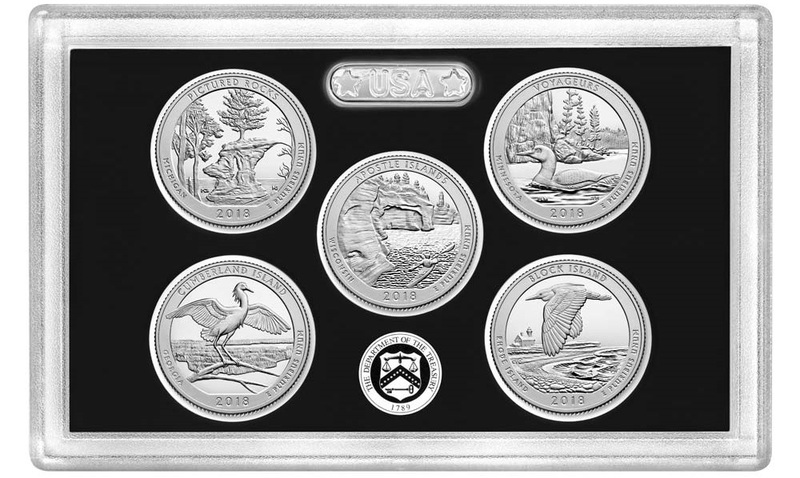 2018 America the Beautiful Quarters Silver Proof Set @ $36.45. Because it was shipped for free, each quarter cost me $7.29. The quarters are deep cameo proof beautiful, and worth every penny. The random news is that, here it is barely two weeks later, and they have sold out. I did not expect that, and I am glad that I didn't wait any longer. It would cost a bit more at my LCS. Obviously the entire silver market is healthy. Building on its success of recent years, Chinese Gold and Silver Exchange (CGSE) has big plans for further expansion, with a particular focus on attracting new business from Southeast Asia. The region is seen as offering significant opportunities, thanks to its strong economic fundamentals and far-sighted approach to value investing. And with China’s ambitious Belt and Road initiative providing extra impetus, now is the perfect time to implement growth strategies and capitalise on any first-mover advantage. With its future headquarters in Shenzhen’s Qianhai Free Trade Zone and a trading platform in Hong Kong, the hub includes a trading hall, a clearing and settlement office, an assay lab, a logistics office, a bonded warehouse and customs facilities, and even safety deposit boxes. 1) He (CGSE president) explains that one immediate objective is to set stringent criteria to create a gold standard that is trusted across Asia and allows for mutual accreditation. 2) Another is to work with accredited vaults overseas, so that physical gold can be delivered to anywhere in the world once a transaction is completed on a CGSE trading platform. 3) A third objective is to provide clear bank records for any transactions, so as to increase transparency and security for traders and underpin customers’ trust in the system. 4) And a fourth is to impose rules which require “full payment and delivery” for each transaction in order to inspire confidence and give peace of mind. I knew of the Shanghai Gold Exchange, never heard about this one. The article says this exchange is over 100 years old. 1) A gold standard trusted across Asia: Standard regulation?